The British Scientific Committee on Antarctic Research (SCAR) published a study, saying that if temperatures continued to increase at the present rate, by 2100 the sea level would rise by up to 1.4 metres — twice that predicted two years ago. This diagram from SCAR report shows temperature trends of 1951-2006 in Antarctica: global warming has so far affected mostly the Western Antarctic Global sea level increase of 1.4 meters will lead to disappearance of island nations like the Maldives and Vanuatu, as well as destroy the coastal towns of Kolkata and Dhaka. Based on the findings of some 100 leading scientists from eight countries, the study's authors argue that a significant role in rising of the global sea level will make the melting of ice in Antarctica. 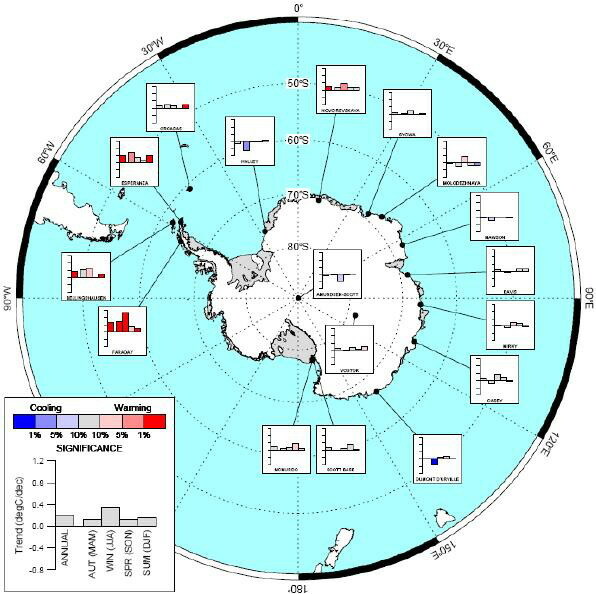 According to the study, man-made hole in the ozone layer had constraining effect on global warming for a large part of Antarctica, but significant ice melting already occurs in the Wesern part of Antarctica. Scientists expect that the hole in ozone layer repairs in the next 50 years, as a consequence of the Montreal Protocol banning the use of ozone-destroying substances. Rising of the global sea level will make London, Shanghai, New York and other coastal cities to spend billions of dollars to strengthen coast from possible flooding. Russian Socio-Ecological Union, referring to the findings of the new SCAR study, says that global sea level increase may have negative impacts for Russia and its coastal territories. According to the SCAR study, even if global temperatures rise by 2 degrees Celsius - the goal of climate agreement, which is to be discussed in Copenhagen -- the global sea level will rise up to 50 centimeters, which is also two times higher than what was predicted earlier. In 2007, the Intergovernmental Panel on Climate Change (IPCC) issued a report, saying that business as usual scenario with an increase of the planet's temperature by 4 degrees Celsius will lead to sea level rise by 59 centimeters by 2100. However, in a recent interview (link: http://www.timesonline.co.uk/tol/news/environment/article6938356.ece) with The Times, IPCC chairman Rajendra Pachauri said that the Copenhagen meeting should have a tighter target of no more than a 1.5C rise in global temperatures, not 2 degrees Celsius.